japanese architects KUS (eijiro kosugi, aya utsumi) have shared with us images of ‘machida m’, a two-storey dwelling on the edge of a residential neighbourhood of machida city, tokyo, japan. responding to the lush forest that slopes up to the north of the house, the design creates an open interface through large stretches of windows to directly engage with the natural qualities of the site. read as a small and simple structure from the front, the house features a dramatically sloped roof form that reaches up to the forest behind. a set of reinforced walls creates a platform between the street level and the existing topography, placing the dwelling on a flat foundation while generating an outdoor terrace and garden in the approach. the front elevation is pragmatically marked by a door and a large floor-to-ceiling aperture that puts on stage the living space within. the activities of the dining room can be extended out on to the terrace through a system of sliding windows. opening to a double-height ceiling, the ground level kitchen and dining space maintains an airy quality and serves as a communal volume that establishes multiple sight lines throughout the house. a slightly elevated room that is directly connected to this space gains definition through contrasting materiality. more private and quiet in character, the second level overlooks the area below as a mezzanine. 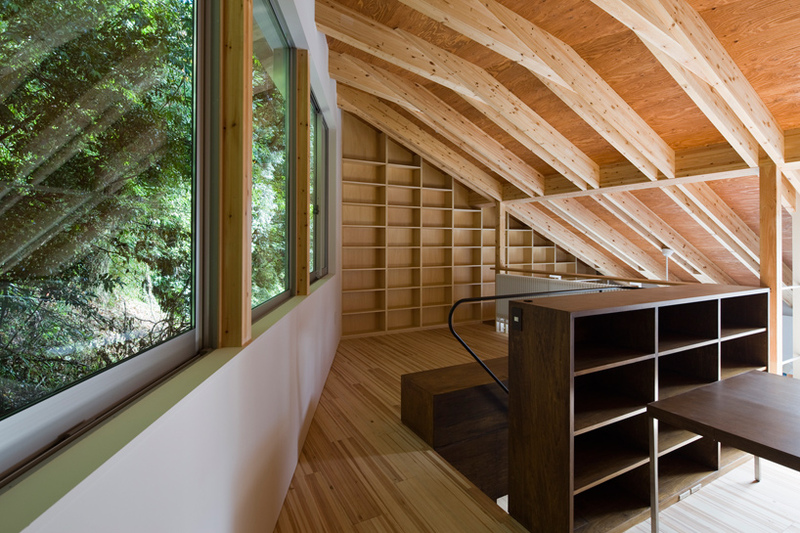 the angle of the sloped roof form is put on focus through a rhythmic composition of beams which line the ceiling in detail. built-in shelving units flank the layout and even juts out on the east side as an elevated library.